The President and First Lady, Clinton and former President Bill Clinton feasted on "surf and turf" at the island resort where, according to the White House, "a good time was had by all." But there was no word on a hug. After an interview in which Clinton questioned some of Obama’s policy choices was published over the weekend, both politicians’ staffs said the two were looking forward to catching up – and “hugging it out” – on the Massachusetts’ island resort. 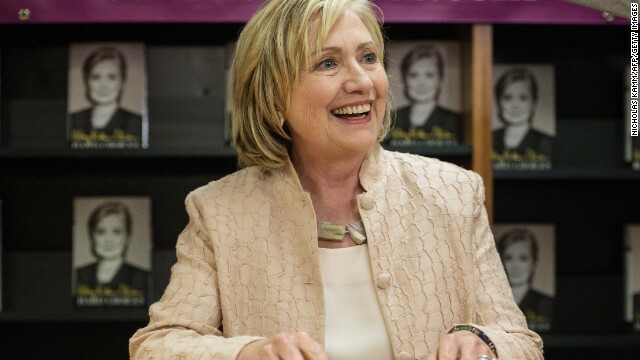 Clinton, speaking Wednesday at a book signing for her memoir “Hard Choices,” said she couldn’t wait. “We’re looking forward to it,” she said of the hotly anticipated embrace. Asked by CNN whether it was indeed a “hard choice” to phone Obama this week, a call meant to explain her interview wasn’t meant as an attack, Clinton said no. “We are looking onwards and upwards,” Principal Deputy Press Secretary Eric Schultz said in a briefing from Martha’s Vineyard. You are right, Hillary will be President and you get Bill to help her, that's Two for the price of one, just keep your daughters FAR away from him. The press will praise her glory and omit her shortcomings, just like with Pres.Obama. "I am just going to sit back and bask in the warmth of your FIRE!!!!" "Also Hillary will be damn near on her knees for President Obama if she decides to run. She needs his help and she knows he can deliver the votes. I realize the GOPT is split but don't worry about us Democrats, we're good." What does she need Obama for? All I ever read here is that she's a shoo-in if she runs. Or is it that she's not as inevitable as we're made to believe? Pick your poison. It will be perilous for Attila The Hen to occupy that office. Hillary never liked or respected Obama, and obviously is reading his declining popularity as an opportunity to throw him under the bus. She is the consummate politician, and walk the fence relative to Obama so as not to offend the "Obama acolytes", but she will also be courting the "center" which is increasingly convinced that Obama is an ineffective and indecisive President. If this frump becomes our next President, we are going to need more than a plunger to pull the country out of the toilet drain. She is the most unscrupulous and disingenuous politician to come down the pike in a very very very long time. After she tosses him under the Bus, comes the Judas Kiss! This women will say anything for 2016! She took care of Barak like Bill Monica took care of Bill. Problem solved. Physical apology. "She took care of Barak like Bill Monica took care of Bill. Problem solved. Physical apology." This is hilarious! these two are two lying snakes in the grass and smile at each other but would cut each other's throat in a minute.